For 2015, I am creating a week-by-week guide to organizing a fundraising program. My ambition is to provide strategic ideas for approaching your work more so than providing some kind of overlay to what you might be doing already. Some of the ideas might work for you now; others might work later in the year. Some might not be relevant for you at all. If these posts offer you some fresh ideas, if they provoke your thinking about getting your work done, if they pull you out of reactive mode and into proactive mode – if they do these things, writing them will have been worthwhile. If you have ever worked for someone other than yourself, you are almost certainly familiar with the annual review process. The essential idea is that management spends a small amount of time with you each year devoted to reflection and goal setting. The best experiences start with the job description to ensure that it accurately describes the actual job (and gets revised as needed to keep it current). Manager and employee then review measurable goals and objectives established the year before, discuss successes and barriers, and establish new marks for the next year. The best experiences head off problems before they get started (accountability), but they are more aimed at helping employees get their work done by identifying and removing barriers. Why not apply this same discipline to the board experience? I’ve been talking and writing about board campaigns for years now in terms of encouraging board members to give to the organization themselves before asking others to give. I first wrote about it and suggested a campaign structure for it on this blog back in 2010, Conduct Your Board Campaign First. Celebration is in order when both the goal and 100% participation are reached. Since then, however, I have been thinking about the evaluation experience more holistically as an annual check-in and essential ingredient for board accountability and leadership development. Some directors are more comfortable than others speaking their mind in large group settings. Annually checking in with everyone helps ensure that every voice is heard. So instead of annually meeting with each board director for the purpose of securing their gift alone, I’ve begun thinking about those meetings as opportunities to review director job descriptions, review measurable goals from last year, and set new goals for the coming year. In other words, heading off problems before they get started (accountability), but helping directors get their work done by identifying and removing barriers even more so. With this in mind last year, I drafted and posted a document on my Resources Page suggesting one approach to these director meetings: Board Campaign Mechanics. It describes the process in some detail, identifies tangible benefits to the practice, and offers a meeting template for use by board leadership. I know of at least three land trust clients that are using this model or one very close to it. All three have seen significant jumps in board member giving and engagement in fundraising as a result. In two cases, board member giving has jumped from less than $6,000 to more than $20,000 in just two years. This kind of visible commitment from the board not only adds to the bottom line, but also inspires giving from others. Note that this is January work regardless of your organization’s fiscal year, because at least some of your directors’ responsibility involves direct contact with donors, and donors operate on a calendar year. Now is the perfect time to set that initial board goal, and February and March are ideal months for these check-in visits. If your land trust uses a one-on-one board evaluation model or board campaign along these lines, I’d like to hear about your experience. What has worked for you? What have you learned that you can share? All comments will be posted and shared. 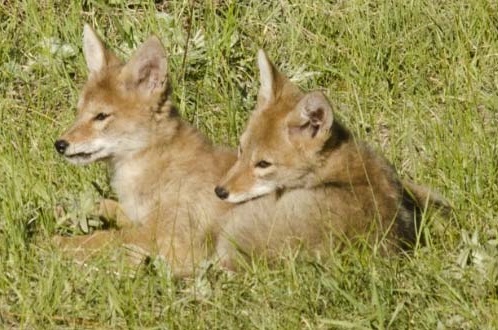 Photo credit: Coyote Pups by Walt Kaesler. Thanks for noticing. I’m delayed by a week. My three words are “Visible”, “Relevant”, and “Generosity”, but you’ll have to wait ’til next week to get a fuller explanation.